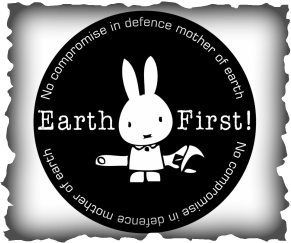 Earth first is a loose network of people, groups and campaigns who come together for ecological direct action. The summer gathering is organised by volunteers and is the place where people involved in radical ecological direct action – or those who want to be involved – get together for five days of time and space to talk, walk, share skills, learn, play, rant, find out what’s going on, find out what’s next, live outside, strategise, hang out, incite, laugh and conspire. The gathering is run without leaders, by everyone who comes along. The gathering is also a practical example of low-impact eco-living and non-hierarchical organising. EF! is about direct action to halt the destruction of the Earth. It’s about doing it yourself rather than relying on leaders, governments or industry. Direct action is at the heart of it, whether you’re standing in front of a bulldozer, shutting down an open-cast mine or ripping up a field of GM crops. EF had a great selection of vegan beers and cider and the bar opened at 7 each night. Thursday night there was films showing in the solar powered cinema tent, Friday night was open mic (not up to standards of previous years but still entertaining), Saturday night was ceidgh time, this provided much merriment.